Fosdem is here again ! In addition to next week event participation for HPE in Cannes, I’ll be at Fosdem the coming week-end in Brussels. And I’m so happy to be able to be there again, as it has been since 2012 that i’ve not participated. This time, it’s not MondoRescue or Project-Builder.org related. But the presentation that was selected is part of the Distributions dev room. The title is “Building Linux distribution packages with Docker”. I’ve been using Docker to help in building packages since a long time now, and Project-Builder.org latest version is now supporting it pretty well to help me package my upstream projects. But I want to cover a different aspect. launch a complete environment, copy the sources into it, invoke the build tools to create the packages and then copy them back to the host, Docker has made all these steps much easier and straight forward, allowing for more rapid package production and automation. This presentation will show a detailed use case for building packages for both Mageia and Fedora with their respective bm or koji tools encapsulated in Docker containers. It should help any upstream packager adopt a similar approach to make his packaging task a breathe. Will be there Saturday the 30th of January (my 20′ talk is at 11:30 in K.4.201) and I’ll stay till Sunday early afternoon. Feel free again to catch me and discuss. When not in my talk, I’ll be in other sessions and also around the Mageia Booth. And come in mass as this is one of the best FLOSS event WW. Really ! Time to Meet at Hewlett Packard Enterprise Technology & Solutions Summit 2016 ! New company name, new event name for our presales and channel partners, but same content of quality with the best experts to transfer knowledge on everything HPE ! And this year, we’ll have a track dedicated to Open Source and Linux ! It’s a first (and hopefully not the last time it’ll be given). And you should be able to meet the Geeks on Wednesday afternoon, myself included. Other subject of interest are the breakouts 86 (Intro to open source infra automation tools), 48 (container and next gen architecture), and 151 (building an open source high perf object storage cluster with Ceph) and of course the Labs (the Redfish and UEfI ones in particular) and SuSE and Red Hat sponsor sessions. Lots to see ! For those of you wondering why project-builder.org and MondoRescue versions are not published more regularly, that gives you again a hint 😉 Not speaking of the next event in March in Grenoble, TES, where I’m part of the Event team this time. Last September, I was diagnosed with diabete. 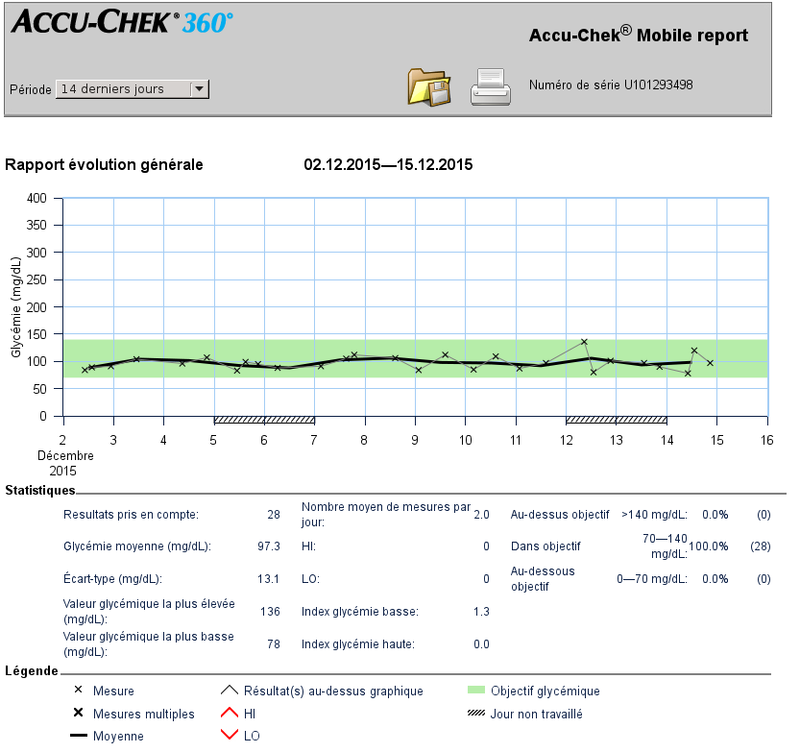 I had to pass 5 days in the hospital for complete exams, and was given insulin to solve that issue. In order to prepare my meeting with the specialist, after 3 months, I wanted to copy everything on my Linux system, and prepare graphs and tables locally, as well as making a backup. But the software provided wasn’t working at all once copied on my system. I had the main page, but nothing was creating the pictures I was used to see when using the device connected through USB. So I made a patch to apply after copying the content of the device on my hard drive, and now everything works as expected. The last patch avoids a check based on the serial number to be done, which was creating issues for me so that’s why I desactivated it. Once you’ve done that, you can enjoy using your device content locally without an issue ! If someone from Roche reads this, would be great to modify upstream for future versions. Anyway, since January, I’ve stppoed insulin as my level was extremely good and I wasn’t needed it anymore. Doing 30′ of bicycle per day and paying more attention to not eat 3 desserts too often (or very large milk-shakes as during our trip in the US, just before my blood test) is definitely helping. The next stpe is to reduce the number of medicines I’m still taking. I should start to test that next month.